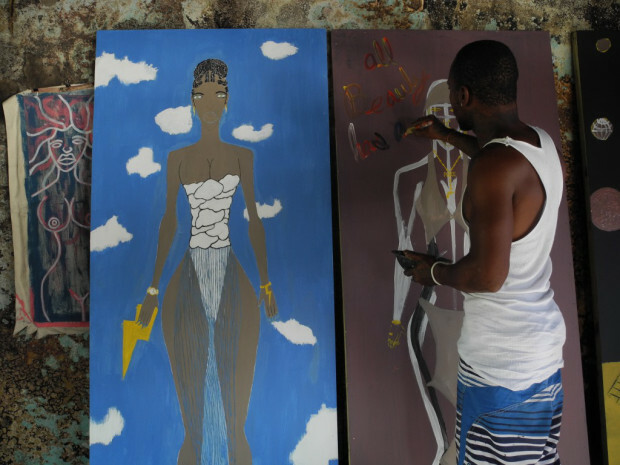 Kingston-based Fashion designer, musician and street artist is one of 10 artists presently featured in the National Gallery of Jamaica’s Anything with Nothing exhibition. Below is a short interview with him, produced with much-appreciated assistance from the African-Caribbean Institute of Jamaica/Jamaica Memory Bank. An artist and entrepreneur from “up-town and down-town”, Black was associated with Roktowa, an arts initiative based in the old Red Stripe Brewery on West Street. He designs dancehall fashion and writes music and poetry. For the exhibition he has painted four large scale versions of his dancehall fashion drawings entitled The Creation.